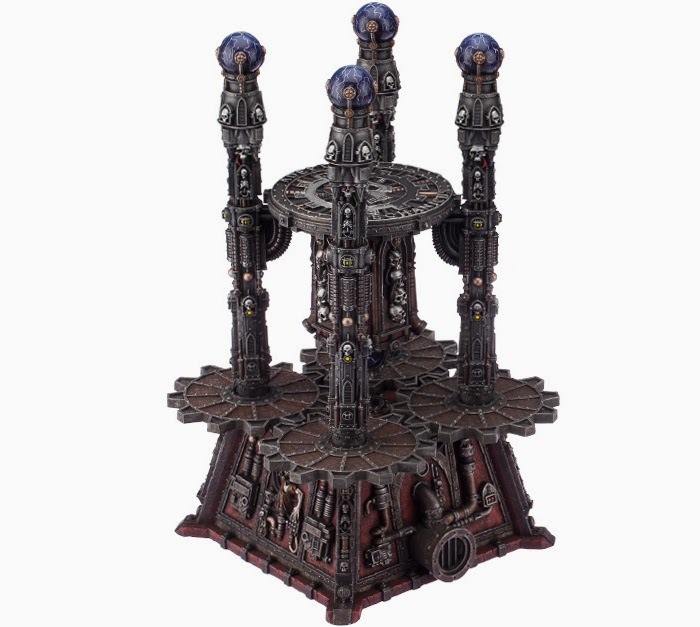 A while back GW announced that they planned to release a model for the Void Shield Generator, and that there would only be 1000 copies of this model made. Now when this was announced my reaction was mild indifference, a limited edition model for a piece of terrain wasn't interesting and when i saw the model itself i became less interested. However while scanning though the blog Faeit 212 (in the hope that there would be any scarp of information about the new wood elf book) i came across a article that stated that GW had over sold the Void Shield Generator, that there were people who had bought the model online but wont receive a model because there were no more models to receive. The Limited Edition Void Shield Generators have been over sold, and there are some readers out there that have your confirmation and still may be out of luck. Personally it sounds like a mess, and I really hope there are not too many readers effected. I think coming to the office Monday morning in certain departments will not be a lot of fun, as this is a really tough issue, and one that needs to be worked out with its customers. The email I have received from one such customer was not a happy one, and also had no solution attached to it to fix the mess. When you are selling a very limited edition of only a 1000, and taking Internet and phone orders from all over the world, its got to be a mess. Not to mention there are some countries where availability only lasted a few minutes. Yes, there are models that doing this would work well with, but the Void Shield Generator was not one of them. Now i am not a huge fan of limited edition stuff to begin with (although i am considering getting the limited edition Wood Elf book when it comes out, because when GW only updates your army once every decade it pays to make to that release as memorable as possible), and making the Void Shield Generator limited edition to begin with was a mistake , the model doesn't really deserve to be limited edition, its not a special character, it doesn't depict some well known battle it just doesn't feel special enough to be limited edition. But then to go and oversell the model, to take peoples money when there wasn't a chance they would get the model is a huge mistake. This is a big screw up and GW should fully refund all customers who paid for but wont get a Void Shield Generator as well as apologise to all the everyone affected by this.Until next time. Absolutely they need to refund, and with GWs customer service history I have no doubt that they will make it right, it is the one area where they truly do a great job at least. Selling it at a low number world wide was the problem, to many trying to get too little. That was their mistake in not setting things up to properly account for the numbers.